In the early 1970s, the major industrial states were preparing to shift to nuclear fission as their principal source of electrical power. But that change has not occurred. In part, this is due to a growing public recognition that techniques and institutions for management of spent nuclear fuel, separated plutonium, and long-lived radioactive wastes are not yet fully developed. The consequent pressures for resolution have spurred a series of often ill-defined and sometimes contradictory attempts to promote international cooperation and control of hazardous activities. How are these varied suggestions to be compared and evaluated? By what criteria can plans be selected that are likely to be both effective and negotiable? 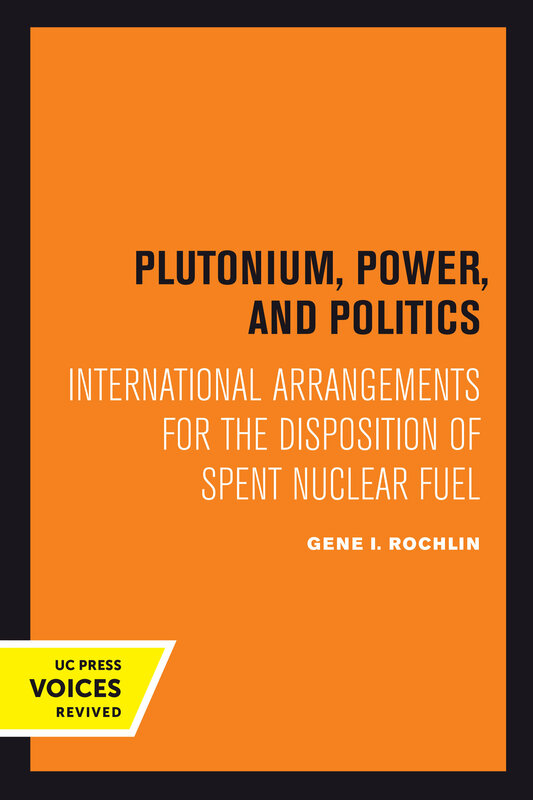 In this study, Gene I. Rochlin, physicist and social scientist, explores the technical, political, and institutional aspects of international nuclear export and fuel cycle policies. He categorizes existing proposals and suggests way to develop new ones that better promote both national and international goals. Dr. Rochlin argues neither for nor against the use of nuclear power or plutonium fuels. Instead, he addresses the question of how international arrangements could be reached that might jointly satisfy the objective of the several key nations, yet not be too difficult to negotiate. He concludes that a major fault has been the tendency to improvise arrangements for specific technical or industrial operations. As a result, overall social and political goals have become the bargaining points for compromise. Yet attempts to simultaneously resolve all problems are unlikely to prove fruitful. Dr. Rochlin suggests instead the formation of institutions organized around more limited social, political, and technical objectives, even at the expense of excluding some nations or omitting some aspects of the nuclear fuel cycle. Only by so doing, he argues, can immediate agreements be reached that preserve the potential for more comprehensive future arrangements without sacrificing industrial, environmental, or nonproliferation goals. This important book will be of interest to scientists, social scientists, government officials, and others concerned with the problems of plutonium management and nuclear wastes. This title is part of UC Press's Voices Revived program, which commemorates University of California Press’s mission to seek out and cultivate the brightest minds and give them voice, reach, and impact. Drawing on a backlist dating to 1893, Voices Revived makes high-quality, peer-reviewed scholarship accessible once again using print-on-demand technology. This title was originally published in 1979. Gene I. Rochlin is Professor Emeritus in the Energy and Resources Group at the University of California, Berkeley.